On America Recycles Day – Are You Recycling Right? Comments Off on On America Recycles Day – Are You Recycling Right? Bloomington-Normal, IL- Nov. 15, 2018 – On America Recycles Day, local government leaders, multiple organizations and the waste industry, are asking consumers if they are recycling right. Based on audits performed by the recycling industry, one in four items placed in the recycling cart is not recyclable which has led to increased contamination. To both reduce contamination and simplify the message, a streamlined recycling flyer has been developed that is virtually universal across Illinois. 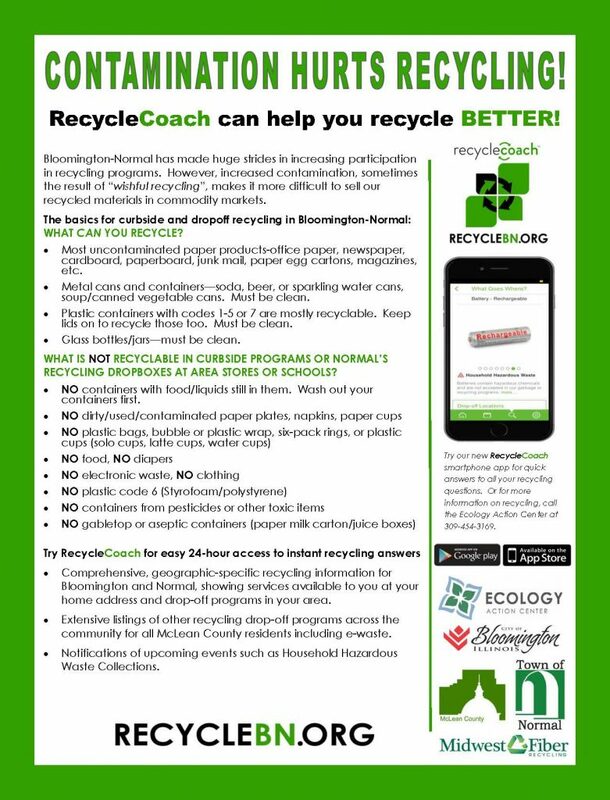 “Beyond that, if local residents want detailed answers of what is and what is not recyclable, they can always call us at 309-454-3169 or check out our easy-to-use Recycle Coach app at RecycleBN.org,” said Michael Brown of the Ecology Action Center. Due to changes in certain recycling systems in Illinois, some of our historically successful recycling programs that have taken part in America Recycles Day are no longer practical to implement in the same way. These changes have imposed local limitations that will affect our ability to continue these events moving forward. As a result, we have come to the unfortunate decision to discontinue fall America Recycles Day and spring MEGA Recycling events. We sincerely thank our recycling partners for their assistance over the years and their ongoing dedication to providing these services to our community. 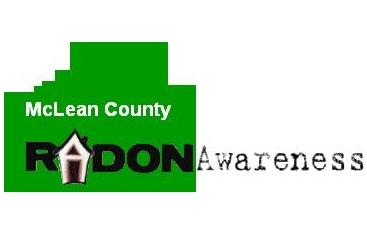 The Ecology Action Center presents the annual McLean County Green Awards to recognize local efforts to improve our environment. Nominations are now being accepted for the 2018 awards, with recipients being named in November at the EAC’s annual fall wine-tasting fundraiser. The McLean County Recycling and Waste Reduction Award identifies businesses, schools or organizations with outstanding recycling programs or waste reduction efforts or individuals who have played a role in a successful program or effort. 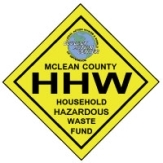 While nominations will be accepted for any recycling or waste reduction project, areas of growing interest include source reduction of hazardous wastes or zero-waste programs. 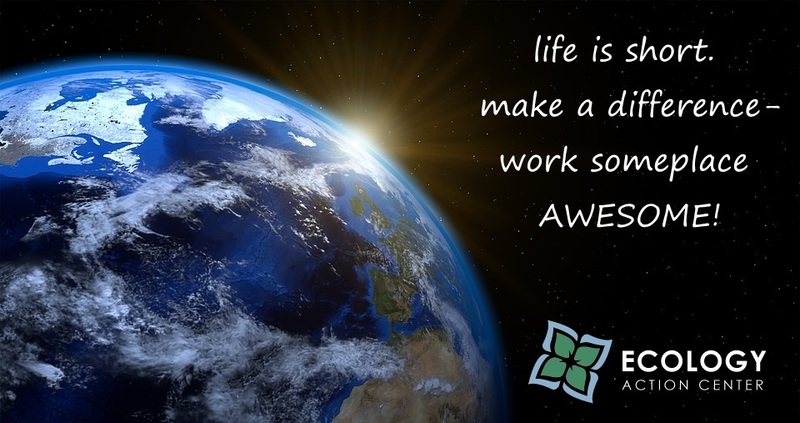 The Anne McGowan Making a World of Difference Award recognizes outstanding projects, activities, or individuals in McLean County who promote environmental awareness or natural resource conservation. The EAC dedicated the World of Difference Award in memory of McGowan, an early director of the EAC, due to her ability to inspire and motivate others to take action. Former EAC Executive Director Michelle Covi described Anne as a catalyst for action. She was energetic and never hesitated to get her hands dirty. Her natural curiosity and love of the natural world fueled her passion for wildlife exploration and preservation. She shared her love with children and adults alike when she conducted nature walks, wildflower walks, and nature programs. She inspired and nurtured life-long dedication to environmental awareness and conservation in children, college students, and adults whose lives she touched. Nominations may be made online at ecologyactioncenter.org/green-awards/ or by stopping by the Ecology Action Center at 202 W College Avenue in Normal; all submissions are due by Monday, October 1 at 5 p.m. The recipients of the 2018 awards will be named at the EAC’s annual Sustainable Gourmet event on Thursday, November 8, 2018. McLean County, IL – May 7, 2018 – The Ecology Action Center (EAC) of Normal, IL, is partnering with the Midwest Renewable Energy Association (MREA) to bring Solar Bloomington-Normal 2.0, the solar group buy program, back to McLean County. The program will help home, business, and farm owners throughout McLean County lower their electricity bills by making solar more accessible and affordable through the power of volume purchasing. “We are excited to partner with MREA again to bring the group buy back to McLean County, providing another opportunity to expand solar in our community! 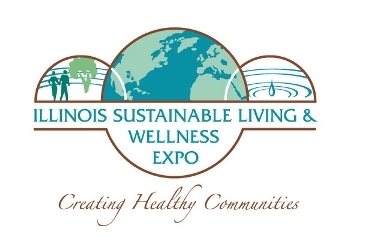 The 2016 program was a big success, and we are confident Solar Bloomington-Normal 2.0 will help our community continue to expand its sustainability efforts,” said Michael Brown, Executive Director for the Ecology Action Center. 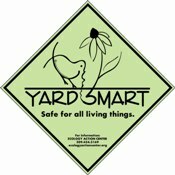 The program launches on Saturday, May 19 with a “solar open house” at the home of Eric Marshall, a participant in the 2016 program. It will be held from 10:00 a.m. to noon. The open house is a chance to see a solar array in action and ask questions, and will not feature the full Solar Power Hour presentation. The first Solar Power Hour will take place Thursday, May 24 at 6pm at the West Bloomington Revitalization Project (724 W. Washington St., Bloomington, IL). More Solar Power Hours will take place throughout the county in the months leading up to the participation deadline of September 30, 2018; all are free and open to the public. Visit SolarBloomingtonNormal.com for a full list of Power Hour presentation dates and locations. The MREA has managed several successful solar group buys throughout the Midwest, including one in Bloomington-Normal in 2016, and two in Champaign-Urbana. To select an installer for Solar Bloomington-Normal 2.0, MREA issued a request for proposals to solar installers in March. A local advisory committee reviewed proposals based on professional certification, experience, and cost. They selected StraightUp Solar, based in St. Louis with a branch office in downtown Bloomington. The advisory committee chose StraightUp Solar for Solar Bloomington-Normal 2.0 because of their high-quality solar installations, building science expertise, emphasis on customer service, and familiarity with the community. They are uniquely qualified to evaluate a homeowner’s energy needs, provide quality solar installations, and even provide a preliminary energy efficiency assessment for each participant. The Solar Bloomington-Normal program enables residents to effectively reduce greenhouse gas emissions and improve local energy security through the generation of renewable energy while simultaneously conserving energy and reducing long-term energy costs at their homes or businesses. For more information about the group buy and to sign up for updates, visit solarbloomingtonnormal.com. Get ready to go solar! The MREA was incorporated as a 501(c)3 nonprofit shortly after the first Energy Fair in 1990. MREA’s mission is to promote renewable energy, energy efficiency, and sustainable living through education and demonstration. To learn more, call 715-592-6595 or visit www.midwestrenew.org. 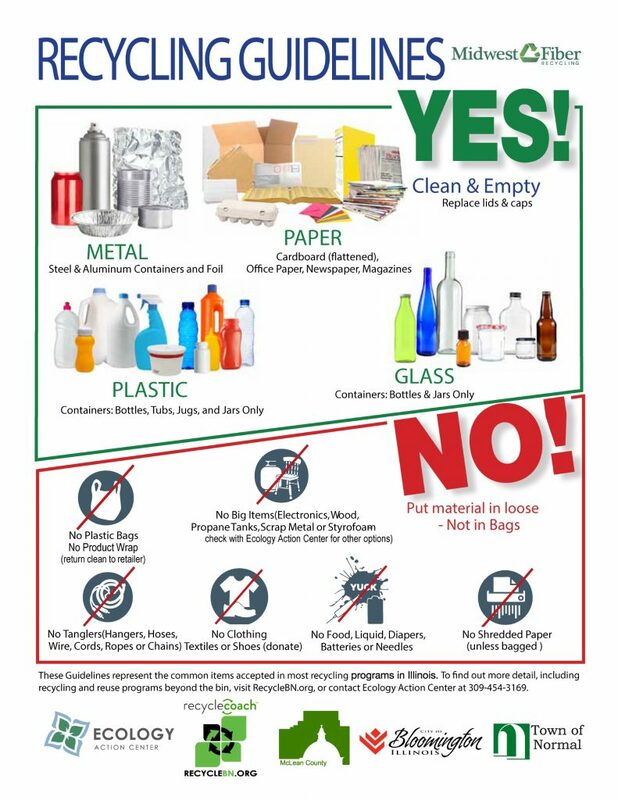 The Ecology Action Center has published a new flyer with updated Bloomington-Normal recycling information in order to help reduce contamination. “Wishful recycling” or lack of proper understanding of what can or cannot be recycled leads to contamination of our recyclables which reduces the value of these materials and weakens the recycling program. See more information in the flyer below or by accessing EAC’s new recycling app–Recycle Coach at RecycleBN.org.